For many people, it's rare to need to Hire a Van - but maybe it's a 'home-move' or a student leaving home and needing to be ferried to college - then a 'Big Van' might be the answer! For the uninitiated (and unprepared), hiring and driving a van can be a daunting experience. The 'Backbone of Britain' for more than 40 years, the Ford Transit is the van against which all others are judged. The Transit is easily one of the most refined vans to drive and it also features a superb gear shift with its standard six-speed manual gearbox. Every Transit comes with ESP, ABS and traction control as standard. Then there's the choice of front, rear and four-wheel drive, short wheelbase, medium wheelbase, long wheelbase and even the extra-long 'Jumbo' Transit van variants! Different body lengths, various roof heights and a number of off-the-shelf body configurations including the 'Double Cab-In Van' crew vans. There aren't too many automatic vans available for hire - so make the phone calls first - if you are an 'automatic only' driver. Get to know the dimensions of your van before you turn the key. Fully familiarise yourself with the length, width and importantly the height of the vehicle! You won't gain many friends by getting your van stuck under a car park height barrier or clattering a parked car with your side mirrors. If you're used to driving a car then you'll need to keep in mind that the wheelbase (distance between the centre of the front and rear axles) will be much longer on a van which means you'll need to give yourself more room before turning in at junctions and around obstacles. Some larger vans, such as Transit Jumbo, 5 metre L5 XL Dropside Vans and Dropwell Luton Removal Vans also have a long body overhang behind the rear axle. This overhang can "whip-around" when a sharp turn is made, which can lead to the rear of the vehicle striking adjacent objects, so take extra care when manouevring these extra-long vehicles. Many vans (especially Luton Vans and Panel Vans with unglazed rear doors) may not have a rear view mirror - don't panic, vans usually compensate with huge door mirrors which will fill the gap. They can take some getting used to though. Keep your 'street cred' by remembering which side of the van the fuel filler is on - we've all been entertained by 'new drivers' over-stretching fuel filler pipes or scrambling to reach the other side of the vehicle to fill up. Also remember that the majority of vans are diesel fueled! A hired van will handle very differently from your own family car; your driving position is usually higher, the gear stick may be on the dashboard and the handbrake could be much more of a reach. Familiarise yourself with the essential controls: screen washer/wipers, horn, indicators, heaters, etc. 'I didn't see the lamp-post because my screen was misty' - is frowned up by police and insurance companies alike. The van will likely be longer than the vehicle you usually drive, so cornering needs more thought - a slower and wider approach is the name of the game. As for brakes... they could feel really fierce - due to built-in braking technology such as 'electronic brake assist' - sounds great, but where will your cargo end up if you stamp on the middle peddle too hard? A heavy load in the back will also increase stopping distances, so think smart and think ahead. There are no prizes for pranging a gate post, road sign or another vehicle - enlist a passenger to help park your unfamiliar van. If you are alone, get out and check the space first. Don't rush into parking, take your time and keep it safe. Watch out for any parking/loading restrictions - you don't want to find one of these stuck to the windscreen! Spread the load items evenly, working from the cab towards the back to keep the weight centralised. Always put the heaviest items on the floor to keep the centre of gravity low and firmly secure any items that may move around during the journey. That fragile box of drinking glasses won't survive the journey if they are not secured properly. Some vans have lashing bars fitted and most have lashing rings on the floor of the load area; use them if available. If an item can move about, it will. Take extra care with external loads; if you need to strap ladders, equipment or materials to the outside of your van - e.g. in a dropside, tipper on on a roof rack - take extra care to ensure that these are properly secured to avoid danger to other road users. Don't rush the job - trying to save time (and hire costs) can prove to be a false economy. Take your time, plan the route, timings and stops. Dashing about leads to frustration, accidents and cargo damage. When you've finished with the van, remember to take all your belongings and valuables with you before returning it to the rental company. You'll be surprised what gets left behind in hire vehicles. Don't forget you will need to take your documents so the van hire company can check you are eligible to drive their vehicles. (Generally most vans are covered by the standard category B driving licence). A current, valid, Driving Licence. Your National Insurance number (This is so that we can check the validity & eligibility of your driving licence - further info on this here). Your postcode, as displayed on your driving licence (This is so that we can check the validity & eligibility of your driving licence - further info on this here). Two forms of identification - with the same address as the licence holder, eg: A utility bill, Council Tax bill, bank statement. etc. These need be less than three months old. Payment for the van rental (and refundable deposit) will be in cash, by debit card or credit card. Drivers must be between 21 and 70 years of age and have held a full U.K licence for at least 12 months. Always check with the rental company first, to avoid unnecessary journeys and delays. Make sure you have the correct hire vehicle insurance cover in place that will cover you for all eventualities. Discuss this with your van hire company, but check the small print to ensure the cover meets all your needs. Don't forget to ask if there are any special rates for weekends or longer hire periods! If you passed your driving test prior to January 1st 1997 you can hire and drive a Minibus on your category 'B' (Car) license with no further training. Drivers who passed their test after January 1st 1997 can only drive a vehicle with up to eight seats (in addition to the driver) - such as 9 seat minibuses - on a standard category B car licence, although certain larger capacity minibuses can be driven on a voluntary basis for non-business purposes. Otherwise an additional category D1 entitlement must be attained. Vans are really easy to drive these days - van technology, safety and comfort has increased exponentially over the past couple of decades. Vans are far more car-like and less 'agricultural' than ever before; they're no longer 'bone-shakers' or requiring you to wear ear defenders! You'll be pleasantly surprised just how comfortable and efficient they really are; you might even be tempted to buy a van for yourself! Vans are a great way to transport the family, dogs, bicycles and shopping. The more up-market vans can rival most cars for equipment standards and safety. Once you've driven a van - you'll be impressed! This blog will keep you up to date with all the goings-on within Maun Motors Self-Drive. Any new fleet additions, body designs and innovations will be posted on here. 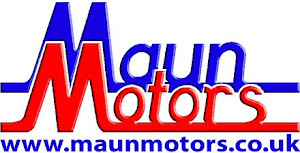 Copyright Maun Motors. Picture Window theme. Powered by Blogger.